WASHINGTON - March 19, 2019 - PRLog -- Sen. Elizabeth Warren (D-Mass.) 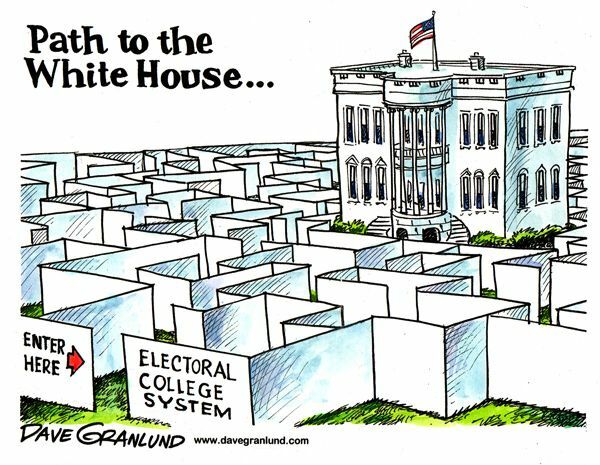 has just endorsed ending the Electoral College [EC], arguing for a system where "every vote matters." But, while she is correct that the direct election of the president is the only system under which voters in all states would have the same voting power, there may be other factors which should be considered, including which residents have the most voting power under the EC, says the professor whose mathematical studies help to almost persuade Congress to vote for direct elections in 1970. Despite the widespread acceptance of calculations of voting power under the EC by Professor John Banzhaf, under what is now known as the "Banzhaf Index of Voting Power," some people still claim that residents of less populous states have the most voting power. That's because they take the number of electoral votes per state divided by the state's population, and note that it is highest for states with the smallest population. But that fraction is irrelevant, and has no mathematical significance, says Banzhaf. He argues that one could also calculate the number of cup holders divided by the horsepower of new models of cars, but the result - like the fractional number of a state's electoral votes per voter - has no meaning or significance. On the other hand, calculations of the chances that a resident's vote can actually effect the outcome of the election - the measure of "voting power" which the courts have routinely used since the Supreme Court's original "One Man, One Vote" ruling - show that residents of larger states such as California, Texas, Florida, and New York all have far more voting power than citizens of the other states. That's because being part of a voting block - whether it's all the voters of California, or three members of the Supreme Court who hypothetically agree to vote as a block - increases the chances that members of the block will be able to cast a decisive vote, says Banzhaf. While equalizing voting power in presidential elections is a very powerful argument for moving to a direct election, there may be other factors which should at least be studied and then considered, suggests Banzhaf. For example, some political scientists have suggested that the EC tends to discourage the formation of third or even more major parties (e.g., libertarian, green, etc.) because, to have any chance of electing a president, the new party would have to show significant strength in many states, not just in a few which may have large number of electoral votes. To the extent that U.S. voters would like to avoid the problems associated with having many political parties as we often see in Europe, this would be an argument for retaining the present system, even if voting power isn't even, and even though the majority vote winner doesn't always become president. Some have also suggested that it is be more difficult to affect the election by ballot-stuffing schemes under the EC than under a direct election since such an effort would require a program which would have to be effective in many states, not just in a few. Studies done in the past have suggested that, under the EC, African Americans, because of the areas in which they tend to be concentrated, have a disproportionate effect on the outcome of presidential elections - an effect which would obviously be eliminated if all citizens had the same voting power. Whether this is still true is not clear and might require further study, as is the policy issue of whether there is sufficient justification for preserving the enhanced voting clout of African Americans. It also seems, says Banzhaf, that a major factor behind the election and continued popularity of President Donald Trump was the very strong dissatisfaction of white working-class voters - the only group in the U.S. and among industrialized nations whose life expectancy keeps going down because of depression-linked alcohol and drug abuse, suicide, etc. If, as some suggest, a direct election would reduce the voting power of this group, which apparently already feels disenfranchised and overlooked, this might be a consideration. Finally, as some have suggested, a direct election would further reduce the influence and importance of the individual states in a presidential election; something the Founding Fathers were very concerned about, and which many state's rights advocates are very concerned about today. Interestingly, it may not be necessary to amend the Constitution to move to a direct election of the president under which all citizens would have equal voting power. The National Popular Vote, which has been described as a workaround or end run around the EC, is an multi-state initiative designed to give the presidency to the candidate who wins the most popular votes nationally. It is essentially an agreement among states for each of them to award its respective electoral votes to the candidate who wins the national popular vote. However, Banzhaf cautions that the scheme might create legal issues. For example, if after the results for a particular presidential election are announced, it might be possible that voters in one or two member states of the compact may have voted overwhelmingly for the other candidate. If that happens, and the legislature amends its statutes to award all of the state's electoral votes to that state's popular vote winner - and thereby defeat the National Popular Vote - it's not clear that there would be a legal remedy - and even a court battle over the issue would create major problems.